Imagine what it would be like to be unable to trust your own perception. I mean, we all feel that way on occasion, as if we’re seeing things that aren’t there, or don’t remember something we feel we should – but what if it were a medical fact that your brain was unreliable? That you were changed, likely never to be the person your family knew, your friends knew – YOU knew. That is Lauren’s life after a severe head injury in the thriller Crooked Little Lies. We don’t enter the story at the time of Lauren’s accident – we come in almost two years later. She has done a lot of recovering from her fall from a bell tower during a salvage job, but she is not whole. She still has a lot of pain in her once shattered hip, as well as a lot of holes in her though processes from her very damaged brain. She’s lucky to be alive, but has to admit that she doesn’t always feel lucky. Lauren is married to the very loyal Jeff, has two children, and a sister, all of whom she loves. They love her back, but with reservations – after her accident she managed to get hooked on OxyContin. There was an intervention. A lot of trust was lost. But she’s better, off the drug and regaining her independence on the day she encounters Bo Laughlin walking on the side of the road. She makes a wrong turn and nearly hits him; he’s so close to traffic. She stops to make sure he’s okay and realizes he’s, well, different. She calls the police to make sure someone checks up on this wandering young man who seems so vulnerable. Then he goes missing. And Lauren’s slowly healing world falls apart. She is drawn to the search for the missing man, and meeting his sister Annie just draws her in further. Lauren was one of the last people to see him, and she feels responsible, the way she feels responsible for so many of the things that have gone wrong in her life. She also keeps having memory lapses and her husband is getting frustrated with her. Her sister is angry with her, her children are angry with her, she is angry with herself for the damage she has caused. But is everything really all her fault? What happened to Bo? Why does her recovery seem to be going backwards? I enjoyed Crooked Little Lies. Author Barbara Taylor Sissel does a great job slowly leading us into the world of Lauren’s accident, drug use, and the aftermath of both. She switches perspective back and forth from Lauren to Bo’s sister Annie, giving us two sides of the same intertwining story. The dual narrative helps keep things from getting too confusing – it’s hard to rely on Lauren’s narrative when she is uncertain herself if what she remembers is true. Annie is more trustworthy, damaged in her own ways, and a really good counterpoint to Lauren’s confusion. Sissel also gets a chance to throw in a love interest for Annie, which is either good or bad, depending on how you feel about mandatory love interests. I personally found it unnecessary and a little intrusive, but on the whole a minor quibble. Crooked Little Lies is well written, the characters of Lauren and Annie are well developed and interesting, and the book is nicely plotted, with enough twists to keep things interesting and pages turning. Sissel does not let us down with a lame non-ending, the book is satisfying though to the last page. 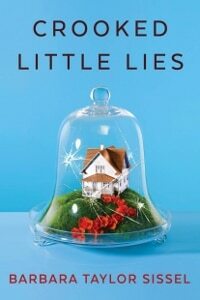 4 out of 5 stars for Crooked Little Lies, and a solid recommendation for thriller readers.